The ancient city lies about 5 km from Chora. 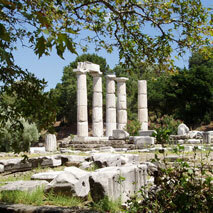 Here you can find the archeological site which is comparable to that at Delphi. 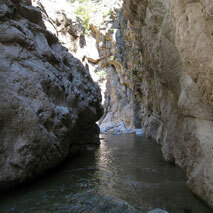 It is highly regarded due to the significance of the antiquities, and the natural environment. Here there is also the “Sanctuary of the Great Gods” where the rites of the Kabeirian mysteries, an international religious institution equivalent to the Eleusinian mysteries, were carried out. The remarkable difference being that the criteria for the Kabeirian mysteries were not based on nationality, social class or wealth, instead they were merely ethical. There is also the “Arsinoe” which is the largest round building in the Greek world and was offered as a gift by a king. Another gift was the world famous “Winged Victory” or “Niki” of Samothraki” (190 B.C) which is prominently displayed in the Louvre Museum in Paris. A copy can be viewed in the Archeological Museum (1955) in Paliapoli. One of the three Towers of the Gatteluzi is also located in Paliapoli. 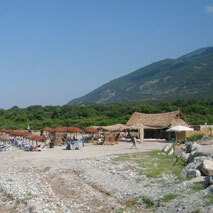 (The other two are in Chora and on the beach of Fonias). 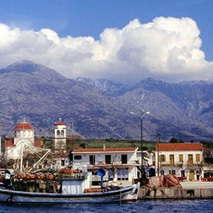 Kamariotissa is the only port on the island, the place where the visitor will first set foot on Samothraki. Originally a fishing village, it has become a seaside hub, full of restaurants, taverns, café-bars, night clubs and shops selling mementos and anything else the visitor might need. Moreover, here you will find Mr. Antonis “Klimataria” tabern, established in 1980 and renowned for its goat and fresh fish. If you visit the church of the village you can see the icon of Panagia Kamariotissa which was washed up on the island in the 17th century. 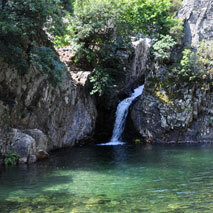 13 km from the port of Kamariotissa one can find Therma, a little village literally hidden amongst the greenery. Built under enormous plane, chestnut and oak trees, among flowing streams, it resembles a fairytale land. From here you can begin your assent for the peak of Mount Saos “Feggari” (meaning moon), or go for a cooling dip in “Gria Vathra” one of the many natural rock carved pools sculpted by the rivers and waterfalls as they pass over the rocks. You can also bathe in the sulfurous thermal springs which have been acknowledged since Byzantine times for their therapeutic properties, or swim at the beach of Therma where the café-bar “Saoki” offers coffee, ice-cream, delicious fruit salads, crepes, and sandwiches to keep you nourished throughout the day. In the evening “Saoki” provides live music to entertain you. Furthermore, in Therma there are many picturesque taverns amongst the wild vegetation and under the deep shade of the plane trees. Finally, don’t forget to take the boat tour of the island which departs from here and takes you to beaches accessible only by boat. If you would like, on the other hand, to walk towards the mouth of the river, where it flows into the sea, you will discover the third of the towers of the Gatalluzi (the others are in Chora and Paliapoli) still looming imperiously over the waves. One of the two most well-known and impressive beaches on the island, you can find it at the end of the road network, on the north side of the island. Its wild beauty, the mass of the mountain which suddenly drops bravely into the sea and the vast expanse of blue which spreads before you is truly amazing. The pebbles are black and smoothly rounded here. From this beach you can watch the moon set and the sun rise simultaneously. 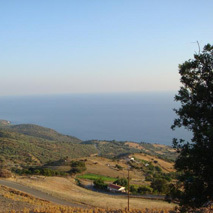 On the south side of the island, perching on the mountainside is the little village of Prophitis Elias. This is the chief destination for whoever wants to try the local roasted goat. 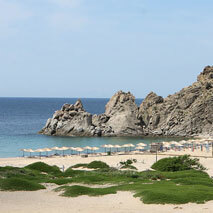 On the south side of the island at the end of the road network you will find “Pahia Ammos”, one of the two most well-known and impressive beaches of the island and the only one with sand. From here it is worth visiting the church of Panagia Kremniotissa which miraculously stands on the sheer faced rocks above the beach. The locals built it exactly on the spot where the the miraculous icon was found, and where, it is said, it mysteriouly returned to whilst it had been taken to Chora. The view from Panagia Kremniotissa takes your breath away. The road network does not cover the whole island. 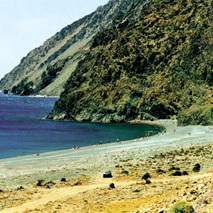 Many of the beauty spots of the island which are really worth seeing can be found just there, in the wilderness of the island where the rugged rocks prevent road building between the beaches of Kipos and Pahia Ammos. In order to go there you can take the tour boat from Therma for a day trip on which you will see: the beach of Batos where the river, which flows into the sea, will lead you to waterfalls and the natural rock carved pools “vathres”, the waterfall of “Kremasto” which is the highest at 240m and spills down a sheer rock face straight into the sea, and the incredible geological formations of “The old lady’s sheets”.